The Zonta Club of Hilo is accepting applications for its 2017 Nursing, Math & Science Scholarships, the Jane M. Klausman Women In Business Scholarship, and the 2017 Young Women in Public Affairs Award (YWPA). Each scholarship awards $1,000; the YWPAA awards $500. The Nursing Scholarship is open to women enrolled in a nursing degree program at the University of Hawaii at Hilo (UHH) or at Hawaii Community College (HCC). The Math & Science Scholarship is open to women enrolled full-time at UHH or HCC, working towards a degree in mathematics, physics, engineering, technology, computer science, pharmacy and astronomy. The YWPAA recognizes young women who are committed to volunteering, demonstrate leadership skills and are dedicated to empowering women and girls. YWPAA applicants are asked to reflect on their volunteer work and the problems limiting the advancement of the status of women in their community and worldwide. YWPAA applicants must be between the ages of 16 and 19 on April 1, 2017, and be a resident of Hawaii County. The application deadline for scholarships and the YWPAA is Friday, March 31, 2017. Applications are available at zontahilo.org or through Zonta Hilo’s Service Chair, Julie Tulang at info@zontahilo.org. The Zonta Club of Hilo will honor Professor Jackie Pualani Johnson with its biennial “Rose Award of Excellence” on Monday, March 14, 2016 at 5:30 p.m. at the Hilo Hawaiian Hotel. The Zonta Rose Award of Excellence recognizes women who have made significant impact on the lives of others through their employment, volunteer activities and associations. The award is part of Zonta International’s observance of International Women’s Day and Zonta Rose Day. Zonta’s mission is to empower women through service and advocacy. Johnson was born and raised in Hilo. She is a graduate of St. Joseph High School, where she began singing under the direction of Clarence Waipa. Johnson received her Bachelor’s and Master’s degrees in drama from the University of Colorado at Boulder. She has performed hula and chanted oli for international audiences, and played a number of roles in local theater productions including Golde in Fiddler on the Roof and Mrs. Lovett in Sweeney Todd. Johnson helped organize, and appeared in, Hilo Community Players’ Shakespeare-in-the-Park, now in its 39th year. For the outdoor summer production’s 25th anniversary, she fulfilled a lifelong dream, presenting a pidgin version of a Shakespeare classic re-titled One Uddah Mid’summah. Johnson is professor and chair of the Performing Arts Department at the University of Hawai‘i at Hilo, where she began teaching in 1979. She has taught acting, stage make-up, costuming and directing, and provided oral interpretation of literature with an emphasis on works by local writers. Johnson has directed more than seventy productions, and plans to retire from UHH in May 2017. Recently, she acted in and directed historical performances for Kona Historical Society including Isabella Bird at Kealapuali, Kona Coffee Days and A Visit to Kalu Kalu as well as scripts based on the lives of female monarchs in Hawaii including Queen Kaahumanu and Queen Liliuokalani. Johnson is married with three daughters and six grandchildren. 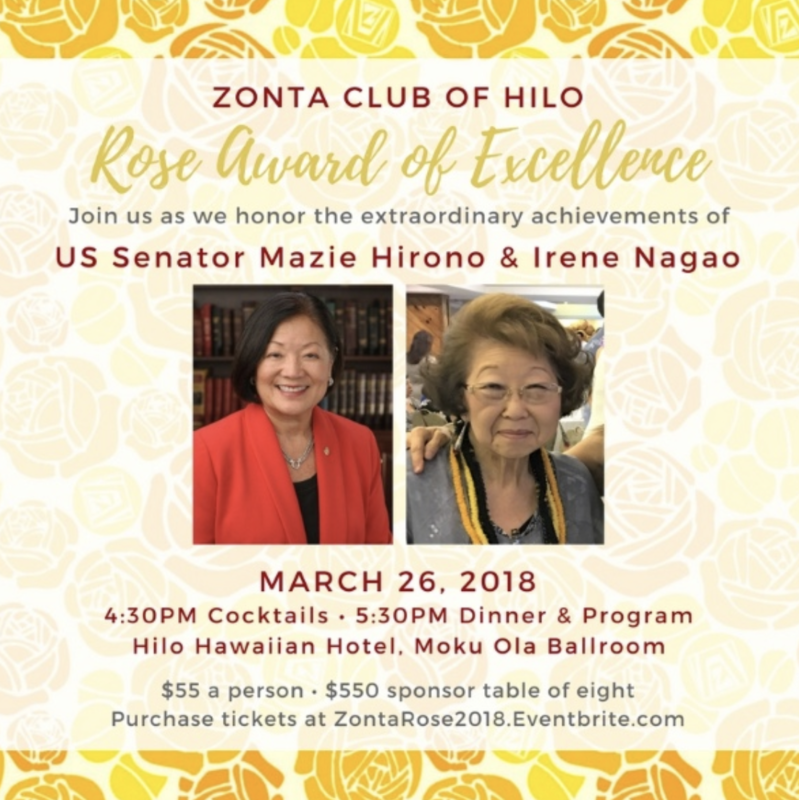 For more information about the Zonta Rose Award event or to purchase tickets—$25 includes dinner—contact Ashley Kierkiewicz at (808) 989-4004 or via email: alk@hastingsandpleadwell.com by March 9. The Zonta Club of Hilo was founded in 1950 and is part of Zonta International, a global organization whose mission is to empower women through service and advocacy. To learn more about the club’s service projects, special events, advocacy efforts and scholarship opportunities, visit zontahilo.org. The Zonta Club of Hilo is hosting a presentation by Kathy Xian, Executive Director of the Pacific Alliance to Stop Slavery, on understanding the dynamics of human trafficking in Hawaii on Tuesday, December 1st, 2015 at the Hilo Women’s Club located at 7 Lele Street from 5:30 – 7:30. The free, public presentation is part of the Zonta Says NO 16 Days of Activism Against Gender Violence—an international campaign that aims to inspire action and end violence against women and girls around the world. 16 Days of Activism kicked off on Nov. 25 (International Day to Eliminate Violence Against Women) and ends on Dec. 10 (Human Rights Day). NOTE: Presentation is free and open to the public. Zonta Club of Hilo president, Tonya Ozone, and Zonta Says NO Hilo campaign chair, Ashley Kierkiewicz, will be present and available for remarks. In addition, Zonta Hilo has teamed up with local businesses to host shoe displays geared towards increasing awareness of gender-based violence. Each display includes a pair of shoes, “Who will be next?” poster, domestic violence survivor quote and resource cards. To date, 12 businesses have agreed to host a display for the duration of the 16 Days of Activism. A limited number of displays are left; interested individuals should contact Ashley Kierkiewicz at (808) 989-4004 or by emailing alk@hastingsandpleadwell.com.